We recently celebrated our 30-year anniversary! Pictured above, members of the Psychology Software Tools team gather around a cake in honor of this occasion. Upgrade Now – 40% Discount Ends Soon! Are you still using a keyboard for responses? Stop! If you are using a keyboard or a mouse to collect subject responses, you are introducing delays into your response data. PST has identified a wide range of variability between devices of the same class having performed hundreds of timing tests with a variety of keyboards and mice. Sound cards are even more prone to the same variability. To eliminate this issue, PST developed the USB-based response and stimulus device, Chronos. Chronos features millisecond accuracy in the areas of stimulus, response, sound output, and external device communication. This level of timing accuracy cannot be achieved using a keyboard, mouse, or onboard sound card. Our timing tests are performed using the Black Box Toolkit. 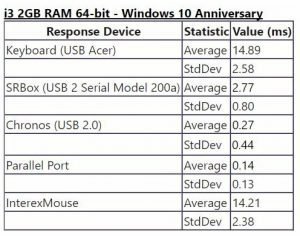 A sample of data collected on a machine that meets the minimal requirements for E-Prime with a Windows 10 OS is summarized to the left. A more comprehensive listing of our timing data for E-Prime 3.0 and E-Prime 2.0 is on our support site. Note the performance of Chronos in comparison to a standard keyboard or mouse. 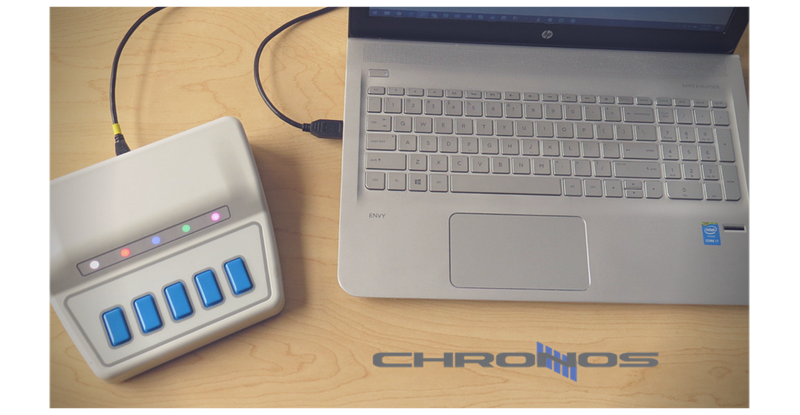 In addition to millisecond accurate timing, Chronos also gives users a solution for communicating with external devices (up to 16 digital inputs and outputs) without the need for a parallel port. To see an example of how we perform timing tests, please check out last week’s YouTube live stream! Also tune in this week to see Devon present tips on getting the best timing from your E-Prime experiment. PST recently exhibited at BrainBox Initiative (left) sponsored by Rogue Resolutions. The BrainBox Initiative is a collaboration with academics from leading universities and provides early career neuroscientists with opportunities to grow, develop and showcase their research. Look for a live stream coming soon demonstrating the communication between E-Prime and the TMS systems offered by Rogue Resolutions. 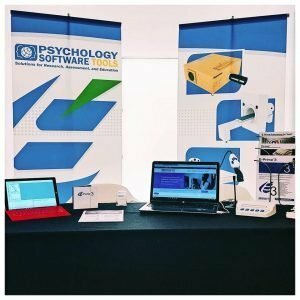 In November we will be exhibiting at Society for Computers in Psychology and Psychonomic Society in Vancouver (Booth #202), and Society for Neuroscience (SfN) in Washington, D. C. (Booth #2631). If you are in attendance, please stop by our booth to see our latest products! Psychology Software Tools was recently audited to recertify the company to the ISO 9001:2015 and ISO 13485:2016 standards. Our audit was successful and our certification is now valid through 2020! 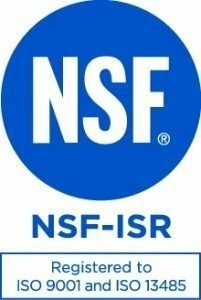 In 2011 Psychology Software Tools, Inc. achieved ISO 9001:2008 certification for the design, development, production, assembly, installation and servicing of products and tools for psychology research, assessment, and education. In 2008 Psychology Software Tools, Inc. achieved ISO 13485:2003 certification for its quality management system related to the design, development, production, assembly, integration, installation, sales and servicing of computerized systems, specialty equipment, and hardware/software accessories for human clinical assessment of psychological, physiological, and neuropsychological function using computerized stimulus presentation, accuracy and response time measures, MRI/fMRI, EEG/ERP, MEG, fNIR, and related techniques. Recordings of our recent live stream webinars are on our YouTube channel. We are continuing to offer weekly live streams for introductions to some of E-Prime’s most commonly used features! Each live session includes a follow-along tutorial and Q&A session with a member of PST’s Support Team. Subscribe to our YouTube channel to be alerted when new videos are available. 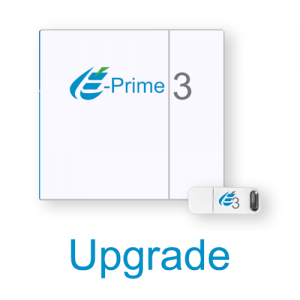 If you are not yet using E-Prime 3.0, you can use the evaluation version during the webinar. The evaluation can be downloaded here. If you are now using E-Prime 3.0, we recommend working through the resources listed on our new website. New resources are being added daily so be sure to check back often! PST encourages researchers to send us a notification of their publications which use our products so that we may list them on our website. If you would like to send us information regarding your publication please email info@pstnet.com.